Born in Texas, Judy has since lived in the Western US, Mexico, and Ecuador. She became passionate about birds after a week-long birding class in Southeastern Arizona. The experience changed her life. She bought books and binoculars and went on to earn a Certificate in Field Ornithology, to start an Audubon Christmas Bird Count in Mexico, and to become a painter of watercolor bird portraits. Judy has traveled to Mexico, Belize, Panama and Ecuador to see, photograph and paint her avian friends. Although photographic realism is not her goal, Judy strives to make each species of bird easily recognizable in her paintings. After that’s accomplished, she employs artistic license with colors, patterns, and textures and takes every opportunity to explore repeating shapes. Incorporating a dry brush technique, her work is characterized by fine brushwork, meticulous detail and fanciful backgrounds. Unique borders tell stories about the birds’ habitats: a sinuous blue-green border on her American Flamingo, for example, represents the cyanobacteria that turn flamingos pink when they eat it. The border of her African Kori Bustard was inspired by Maasai tribal designs. Her tropical Wood Stork is framed by bamboo. Returning to the United States from Ecuador in 2012, Judy settled in Santa Fe, New Mexico where she creates, shows, and sells her work. She is the 2018 president of the Santa Fe Society of Artists in Santa Fe and a signature member of the New Mexico Watercolor Society. 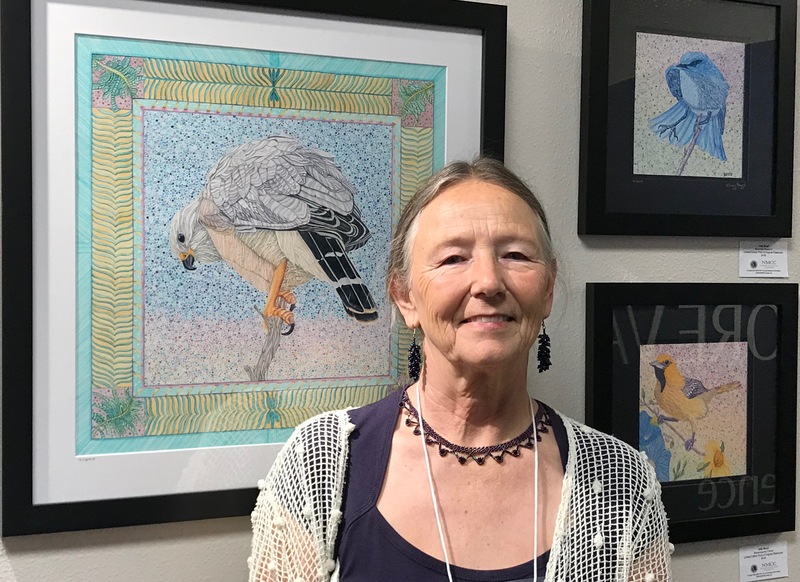 Her bird portraits have been selected for juried exhibitions in Arizona, California, Colorado, New Mexico, Texas and Mexico. She had the honor of being selected as an Artist in Residence at the Audubon Camp on Hog Island, Maine in August 2017. Her work can be seen online at Birds-by-Boyd.com. My first attempt using watercolor with a bird for a model resulted in a lifetime love affair with birds and painting them. Watercolor turned out to be the perfect medium for capturing these amazing, intelligent, soft, ephemeral beings. The more birds I painted, the more I wanted to learn about them. This fascination led further to earning a Certificate in Field Ornithology and international travel to see and paint birds. No longer limited to detecting poisonous gas in a coal mine, birds are now our early warning system of ecological change and distress around the world. According to the April 2018 State of the World’s Birds report from BirdLife International (www.birdlife.org), almost 40 percent of the bird species in the world are in decline, nearly 1 of every 8 species. In a time when our own Migratory Bird Treaty Act of 1918 is under attack, I hope my art reminds people of the birds they love and the necessity of international cooperation in protecting the health of the planet that we all share.